The UK is enjoying the warmest day of the year so far, with temperatures reaching 18.3C in some parts. 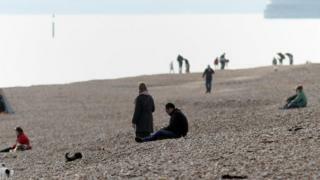 Forecasts had predicted a peak of 17C for Monday but warmer weather has been recorded at Kew Gardens in south-west London, and Northolt in north-west London. This has not broken the record for the hottest day in February, however - that was 19.7C in 1998. The warm weather is due to tropical Atlantic air blowing across the UK. Heathrow Airport saw highs of 18.1C and 17.5C was recorded in Marham, Norfolk. BBC Weather presenter Louise Lear said there had been "glorious weather" in some parts of the UK. "East Anglia and parts of the South East have seen the best of the warmth today [at] 18C," she said. "It really does feel like spring is just a hop, step and a jump away. "But there is cloud out to the west creating some drizzle, so it is a little disappointing here [even though] it's still mild." She added that westerly winds will continue to drive in cloud and, by the end of the week, temperatures could be closer to single figures, with London expected to reach 10C.